Hotels in Venice can be expensive or below standard. I recommend staying in Venice Mestre where you can find reasonably priced hotels. Together with Rome and Florence, you’ll be sharing Venice with thousands of other tourists. To take picturesque Instagram shots in front of the Venice landmarks, you may consider waking up for sunrise. 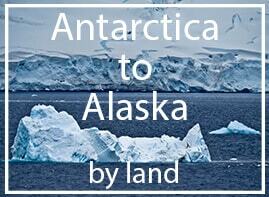 As a result there’ll be no other tourists. When you visit Venice you’ll definitely visit St Mark’s Square and so will every other tourist in Venice. This part of Venice therefore is the busiest. In the square you’ll see several famous landmarks of Venice. 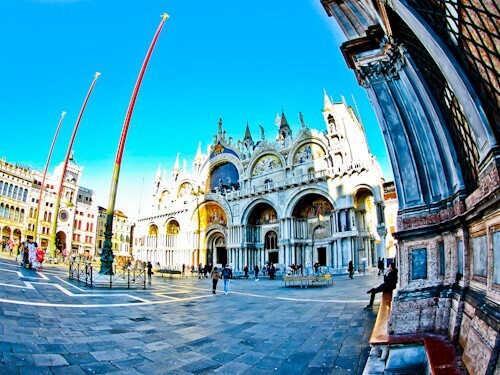 Famous landmarks of Venice located in the square are, the Clock Tower, Basilica, Campanile and Doge’s Palace. 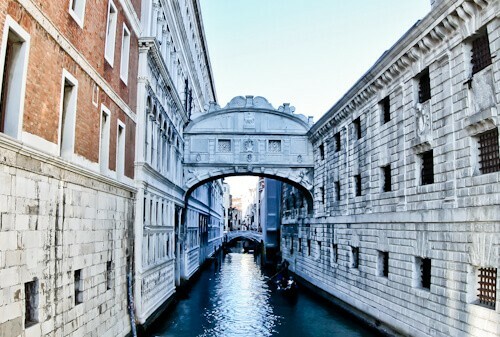 In addition, the Bridge of Sighs and Grand Canal are around the corner. If you decide to buy a coffee or eat a meal in this part of Venice it could turn out to be one of the most expensive of your life! If you’re lucky (or unlucky) whilst in Venice you’ll experience a high tide. During high tide the square floods. Photographers can take advantage of this and make some wonderful reflection shots of the square. Under normal circumstances, to photograph this Venice landmark empty, you should visit at sunrise. 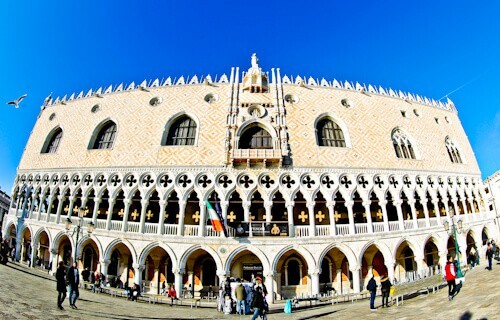 Doge’s Palace is a palace of architectural style Gothic Venetian. I photographed the palace from the plaza but it it’s better photographed from the Grand Canal. Italy used to be several countries and the Venice area was known as the Most Serene Republic of Venice. During this time Doge’s Palace was the home to the Duke of Venice (Duke = Doge). It’s the Venice equivalent to the Royal Palace of Turin (Duchy of Savoy). 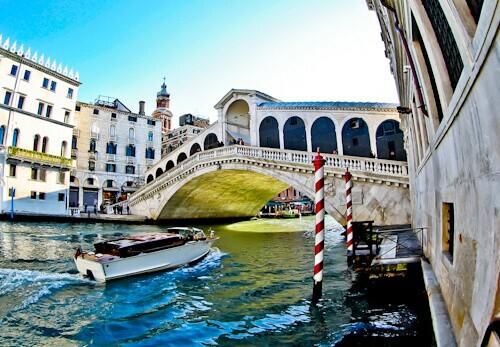 Rialto Bridge is the oldest and most famous bridges of Venice. It crosses the Grand Canal and dates back to the 16th century. Similarly to the Ponte Veccio in Florence, it has designer shops located on it. The bridge is one of the top tourist attractions of Venice so it’s likely to be packed when you visit. It’s also considered to be a romantic location so it could be a good place to take a gondola ride under with your loved one. In addition, I recommend you take this ride at sunset for stunning Instagram pics with a colorful sky. The Bridge of Sighs connects the prison to Doge’s Palace. This is how it got the name, Bridge of Sighs. Prisoners would sigh as they got their last glimpse of beautiful Venice before being taken to prison. You could take a gondola ride under the Bridge of Sighs but I think the Rialto Bridge is a more romantic location. In addition to their being more light, it’s not located next to a prison! If you use the water buses (or taxis) in Venice you’ll use the Grand Canal. It’s the main artery of the city. Additionally when you take a gondola ride, it’s likely to start in the grand canal before going to a more secluded interior canal. It’s worth taking the public transport through the grand canal to see all the different architecture of Venice. Lining the canal are Venetian Gothic, Renaissance, Baroque and Neoclassical style architectures. I took a water bus from the main Venice bus station to Burano and passed through a huge part of the Grand Canal. As well as witnessing the different types of architecture, you’ll see locals going about their daily business. 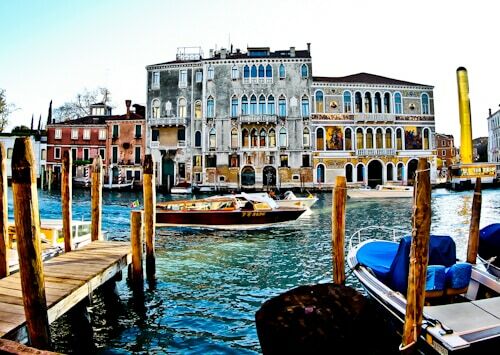 You’ll see post being delivered on Italy Post or DHL boats – Venice is another world! One of the famous postcard pictures of Venice is the Church of San Giorgio Maggiore. You can view this from Doge’s Palace. It’s unlikely you’ll visit the church as it’s located on the opposite side of the Grand Canal. Still, you can make beautiful photos of it (above). If you decide to make the trip across the canal to see it, you can ascend the bell tower. From here you have wonderful views over the Grand Canal and Venice. Whilst walking around Venice you’ll pass many quiet canals. These would be the backstreets of any normal city. These quiet canals offer beautiful reflection photography and peace away from the tourists. It’s worth exploring these quieter parts of Venice as you’ll be rewarded. I found a restaurant selling freshly made pasta for €5 per dish. You may think, what’s special about this? You should look at the price of a pasta dish on St Mark’s Square and you’ll see why! 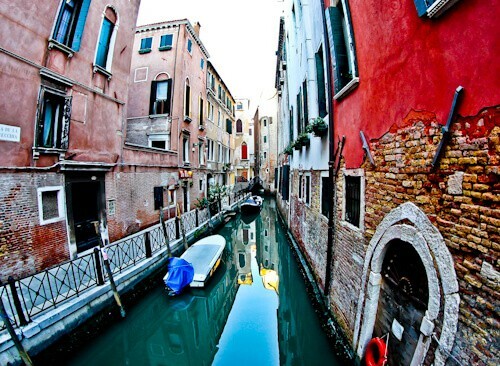 If I was to take a romantic gondola ride in Venice I would choose one of these quiet canals to take it on. When you make the trip from Venice to Burano or Murano you’ll pass through the Venetian Lagoon. 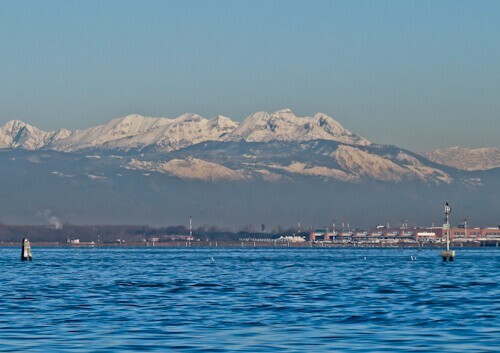 Whilst passing through the lagoon you will have a view of the Italian Alps (above). 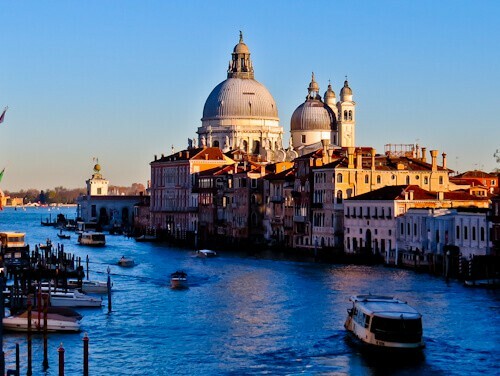 Venice is not famous for this view but make sure you check it out! In addition to the view of the alps, you’ll pass by Venice Cemetery. In fact this is a stop on the Venice water bus system and you can explore the cemeteries. 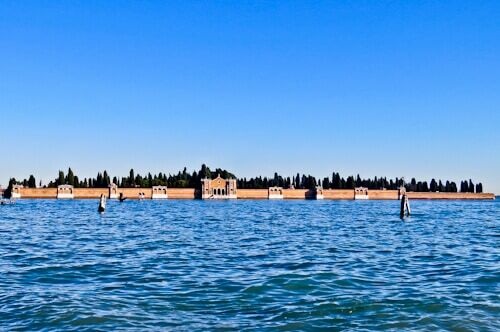 Venice Cemetery is known as San Michele Cemetery Island. Because Venice is an Island with limited space it was deemed unsanitary to bury the dead there. San Michele Cemetery Island was the solution to this sanitary problem. The cemetery contains several mass graves of the dead from World War I. Additionally, several famous Venetians have been buried here. Today, the cemetery is still in use. In your country it’s likely the dead are brought to the cemetery in a hearse whereas in Venice the dead are brought by gondola. No trip to Venice is complete without a boat trip through Venice lagoon to Burano and Murano. Burano is famous for its colorful houses and canals. Photographers love Burano as you can photograph perfect reflections in the calm canal water. In addition to the colorful houses is the church of San Martino. Similarly to the Leaning Tower of Pisa, the bell tower of Burano church also leans. It’s not nearly as beautiful as the Pisa bell tower but with the colorful houses surrounding it, you can create a beautiful picture. Equally as important as a stop in Burano, is a stop in Murano. Murano is famous for its handmade glass. 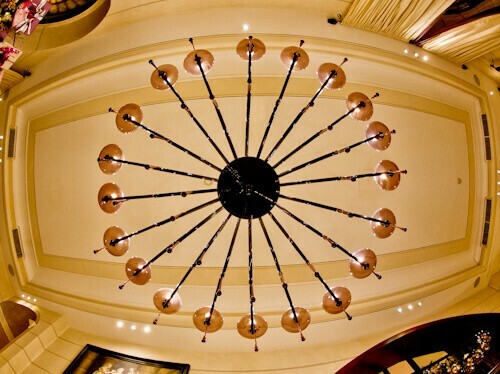 In fact whilst staying at the Victoria Hotel Letterario in nearby Trieste, they had brought a beautiful chandelier from Murano (above). In Murano you can visit the factories in which these glass products are created. In addition to the more extravagant items, you may buy small souvenirs and jewelry made in these factories. I took a Flixbus from Venice to Ljubljana. 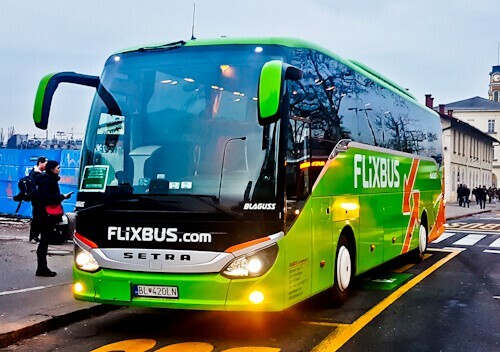 You can take the Flixbus from either Venice main bus station or Venice Mestre, outside the train station. As always with Flixbus, you travel on a modern bus with plenty of legroom. Additionally there is complimentary WiFi and device chargers. On the service from Venice to Ljubljana you’ll come across lots of Slovenians who are traveling from airport in Venice to Ljubljana. It’s much cheaper for them to fly from Venice airport than Ljubljana airport. 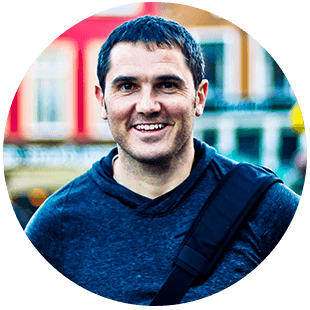 Things to do in Ljubljana and Trieste Italy.